"...has every chance of reversing that form on 5 lb better terms..."
Very smart chaser who won eight times in 2017/18, including Kauto Star Novices' Chase at Kempton and four-runner Reynoldstown Novices' Chase at Ascot (jumped well in lead to beat Ms Parfois by eight lengths). Proved at least as good as ever after seven months off when two lengths second to Definitly Red in Charlie Hall Chase at Wetherby last time, making running until bad mistake third (rider lost irons soon after). Makes belated handicap debut over fences and sure to make a bold bid, though handicapper hasn't taken any chances. 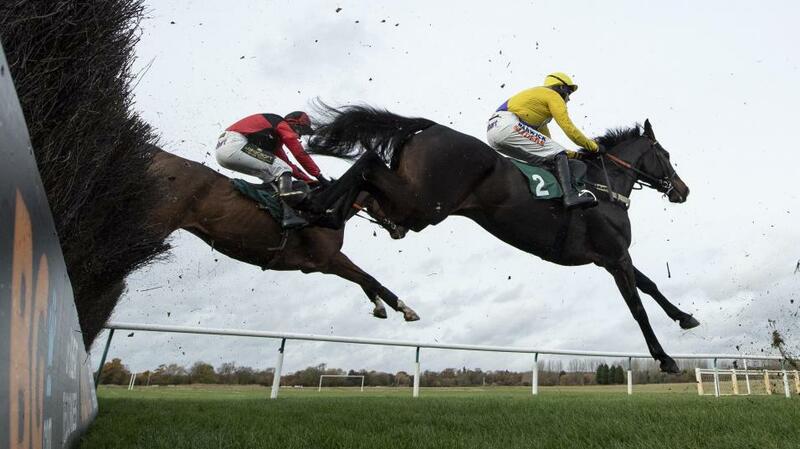 Consistent in his novice season over fences, ending it with placed efforts in Grade 1 events at Cheltenham and Aintree, and showed improved form after seven months off (had breathing operation) when winning four-runner listed event at Sandown (by half a length from Thomas Patrick) last time, leading near finish. Stamina one of his main assets and seems sure to mount another bold bid despite 4 lb penalty. Tall, useful-looking gelding who had some very smart form over fences in 2016/17, completing hat-trick in novice handicap at Uttoxeter (by eight lengths from Rock The Kasbah). Produced best effort in 2017/18 when runner-up in Cotswold Chase at Cheltenham (eight lengths behind Definitly Red), and not disgraced in face of stiff task in Gold Cup at same course on final outing. Sent off well-supported second favourite when disappointing in this race 12 months ago, but makes return from 3 lb lower mark, and still not fully exposed as a chaser. Progressive chaser in 2017/18, winning novice handicap here and novice at Doncaster (by three lengths from Baden), before producing best effort when length second to Crosshue Boy in novice handicap at Ayr final start. Shaped well after seven months off back over hurdles here last time, and should be spot on for this now. Could have even more to offer and remains feasibly treated. Shortlisted. Much better chaser than hurdler, winning novice at Chepstow, handicap at Newbury and Grade 3 handicap at Aintree (by four lengths from On Tour) in 2017/18. Improved further after seven months off when half-length second to Elegant Escape in listed event at Sandown last time, typically jumping well and only collared late on. Plenty of scope, so entitled to come on for that, and has every chance of reversing that form on 5 lb better terms. Forecast rain in his favour and looks a big player. Produced career best after six months off to record first handicap win at Fontwell (21f) last time, forging clear to beat Capeland by 11 lengths. Subsequent 5 lb rise looks fair, and has fitness on his side, but this is a much deeper race and he needs to improve again to trouble the principals. Won Rehearsal Chase at Newcastle (by two and a quarter lengths from Bishops Road) in 2017/18, but hit and miss after, pulled up in Scottish Grand National at Ayr final start. Record fresh is a plus and not badly treated if back to best after seven months off. Smart handicap chaser who won at Fontwell (21f) and Sodexo Gold Cup (Handicap Chase) at Ascot (by four and a half lengths from Rock Gone) in 2017/18. Off seven months/first start since leaving Jonjo O'Neill, ran creditably when five and a half lengths third to Traffic Fluide in latest renewal of Sodexo Gold Cup last time. Perhaps vulnerable for win purposes again here, though. Likeable mare who won mares' handicap at Cheltenham (2½m), listed mares' novice here and listed novice at Warwick (by five lengths from Duel At Dawn) in 2017/18. Good three and three quarter lengths second to Terrefort in Mildmay Novices' Chase at Aintree final start, typically jumping well. Strong stayer who has been well backed for this in recent weeks and has to be considered. Useful chaser who won novice at Exeter (19f) and handicap at Perth (by four and a half lengths from As de Pique) in 2017/18. 7 lb higher in a much better race now and could find this too much. Also entered in Rehearsal Chase at Newcastle same day. Below form when well backed for return in Old Roan Chase won by Frodon at Aintree in October, but bounced back to form in first-time visor when three lengths second to Mr Medic at Ascot last time. Not the most reliable, though, and not sure to build on that. Won 2½m maiden at Ffos Las and novice at Exeter (by three and a quarter lengths from Report To Base) in 2017/18. Shaped encouragingly after six months off in handicap at Cheltenham, but went wrong way from that when pulled up in BetVictor Gold Cup (2½m) won by Baron Alco back there last time. Others hold more persuasive claims and also entered in handicap at Newcastle same day. Smart handicap chaser who has looked back to his best, winning both starts this season in good style, latest in amateur event at Cheltenham (by eight lengths from Station Master), jumping soundly and making all. Arrives at the top of his game and looks well-in under 4 lb penalty here. Has to be high on the shortlist.